With the BlackBerry Messenger for Android and iOS App, you can do more than just chat with a friend one on one. You can share attachments like photos and voice notes, all in an instant. Also, You can invite up to 30 friends to chat together, share photos, schedules and lists with BBM Groups. Isn't it interesting ? Well, if you are still new to the BBM App or you still don't know how to work around it yet. 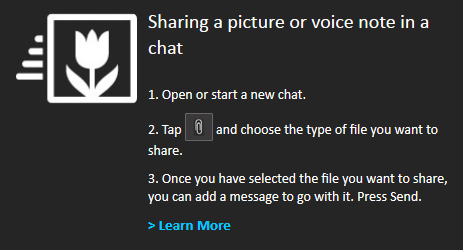 In this post, you will learn how to share a picture or voice note in a chat and also learn how to join or create a BBM group. Here we go !!! The picture/voice note sharing process and group joining/creating process is very simple and easy to get. Following the images above will guide you a lot. If you have any question or help with the process in the images above, kindly drop those questions using the comment box below. Hope this helps !! !